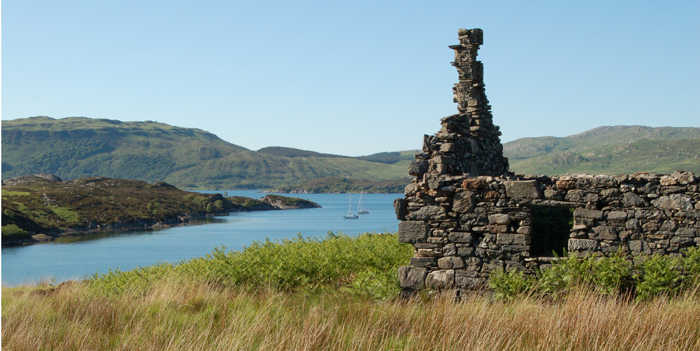 This is a fairly narrow inlet on the north side of Oronsay in Loch Sunart. 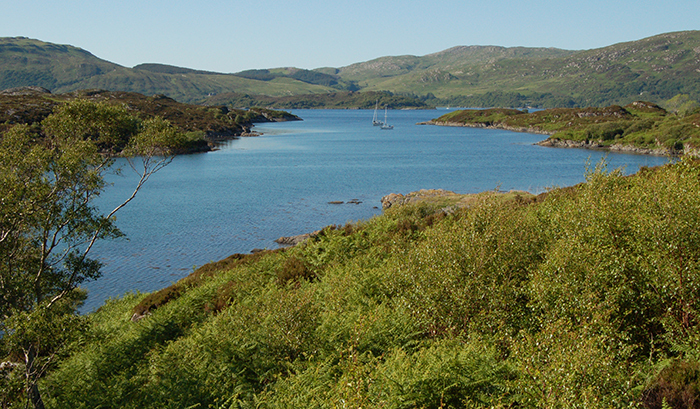 Oronsay is the island which forms the N. side of Loch Drumbuie. The approach is straightforward, but the entrance does look fairly narrow, and you need to watch out for rocks on the NE side of the entrance. Once in, the rock walls of the inlet gave excellent shelter in the NW wind. We motored around the inlet checking the depths, and then anchoring in the middle, putting out about 22m of chain, probably rather more than we needed, as it turned out. Walking on the island is a revelation; we'd just taken it for granted when anchoring on the other side, in Loch Drumbuie, and never explored it. However, there are the remains of several cottages in the central area, and the island is crossed by carefully constructed walls. We even came across what appeared to be a very overgrown, but, well constructed road or wagonway. There is a very large fish trap on the Drumbuie side, and from the walls, waggonway, and cottages, I presume that the inhabitants were able to feed themselves from livestock and crop rearing. I wonder why the island became abandoned. Anyone know? There were no sheep or cattle on the island, at least not where we were. There was a lot of evidence of deer, although we didn't see any, and, possibly, hare (although I am not an expert on animal toilet habits or remains). Midges and ticks were in abundance. Apart from a couple of trickles, there were no streams near the houses. I suppose the people collected rainwater and perhaps used wells or cisterns to store the trickles. 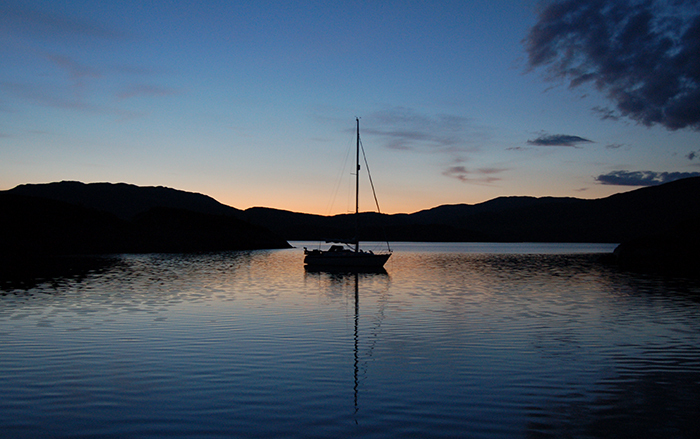 We returned to the boat for a really peaceful evening and night. It was pretty light until midnight, this pic of "Naisso", a Westerly Typhoon, being taken at almost half eleven. We had to return home today, so started lifting the anchor at 0615. I'd incorrectly assumed the bottom was sand, but it was glutinous grey mud, real sticks-like-excrement stuff, and much more gluey (even) than Loch Aline or Puilladobhrain. It was extremely difficult extracting the anchor from the gunge. Strange smelling stuff - even after several scrubs, and a bath, I can still smell it on my, by now, very clean fingers. Overall, an interesting and wonderful place, although walking on the island is tough going, very hummocky, with a lot of bracken to wade through. Next time we're in Loch Drumbuie I'll make a point of visiting the fish trap.